Just a few miles south of Primm in California near the Primm Valley Golf Course, lies the massive Ivanpah solar power facility. It opened in February 2014 with a construction cost of $2.2 billion. It’s the world’s largest solar power station. The project was scaled back from its original plans to avoid further disturbing the habit of the endangered Mojave desert tortoise. The Ivanpah system has a total of three thermal plants spanning 4,000 acres, about six square miles. It lies on public land. The solar facility is adjacent to the Mojave National Preserve. The massive solar farm slopes gently upward towards the Clark Mountains west of I-15 with three large towers. The major environmental concern for the project was for the Mojave desert tortoise. Many desert tortoises found on project site were relocated to other parts of the desert. However, there was concern over this by environmentalists as the stress of relocation can be fatal for tortoises. The Ivanpah dry lake bed is east of the facility. The solar power facility is fenced off to keep out some terrestrial wildlife. Wildlife still faces significant risks. Birds can collide with the heliostat mirrors, or burn in the solar flux created by the mirror field. 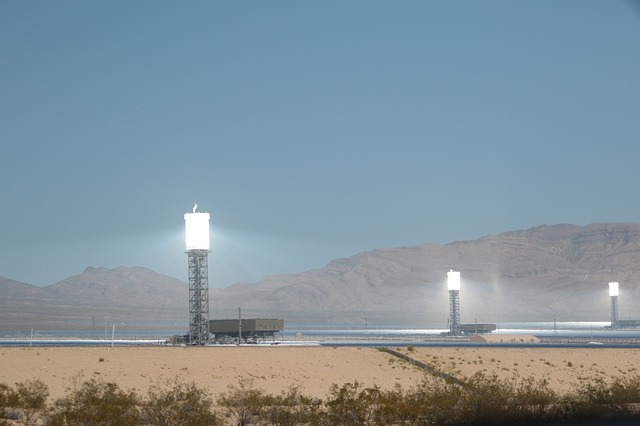 As of 2014, hundreds of birds, including peregrine falcon and barn owl, were reportedly killed due to the intense heat/radiation of the solar heliostat mirrors. Bat deaths were also incurred. Air temperatures can reach 1,000 degrees in parts of the solar installment. To conserve scarce desert water, the facility uses air-cooling to convert steam back into water. Another potential issue is the effect of intense mirror glare on airplane pilots. However, after several years in operation, in 2017, after improvements, the plant was meeting electric output requirements, and is connected to the electrical grid.